THE PUBLICATION OF the US Attorney General’s view of the Mueller investigation report has led to all sides of the political divide claiming a vindication of sorts. 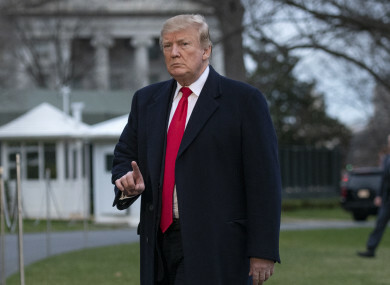 President Donald Trump claimed the findings were “a complete and total exoneration”, but the report itself stated that it did not exonerate the president on the question of obstruction of justice, only that it did not conclude he committed a crime. Special Counsel Robert Mueller’s investigation into allegations into collusion between Trump’s campaign and Russia has led to the indictment of 34 people, but no more are recommended. For Democrats, that does not mean the end of the matter. So far, all politicians and the media have been reacting to is the letter sent from Attorney General William Barr to Congress about Mueller’s report. Democrats want not only the full report published, but also details from the 22 months of Mueller’s investigations. In a joint statement, House Speaker Nancy Pelosi and Senate Minority Leader Chuck Schumer said it is now urgent that “the full report and underlying documentation be made public without any further delay”. In short, they are not going to take Barr’s word for it on the report and have vowed to push on with the numerous other investigations into Trump that are being carried out. But what does the report mean for the possibility that Democrats could pursue impeachment proceedings against Trump? Impeachment proceedings have only been initiated against three US presidents but they’ve never caused a president to be removed from office. When Republicans tried and failed to impeach Bill Clinton during his second term it helped his popularity and senior Democrats are worried of this effect ahead of the 2020 presidential election. For a US president to be successfully impeached and removed from office, the article or articles of impeachment would have to be passed by a simple majority in the House of Representatives and a two-thirds majority in the Senate. While Democrats now control the House, Republicans increased their Senate majority in last year’s midterms. It is therefore seen as highly unlikely that impeachment proceedings would be successful unless there was overwhelming evidence against Trump that Republicans could not ignore. Pelosi stated as much recently, saying that she could only see impeachment as being a valid option should it command the support of Republicans as well as Democrats. But some other senior Democrats do not share Pelosi’s view. Representative John Yarmuth, who is chair of House Budget Committee, told CNN that the question of impeachment, “is not a question of whether, it’s a question of when”. It had been hoped by Democrats supportive of impeachment that Mueller’s report would be so overwhelming as to make Yarmuth’s prediction be correct. The initial reaction to Barr’s assessment would suggest that this is not the case and that impeachment is further away that it was before the weekend, but this may not necessarily be the case owing to his comments on obstruction of justice. With Trump not cleared on this question, it raises the prospect that this avenue could be one ultimately pursued by Democrats seeking an impeachment. The question of impeachment is not a criminal one as it tried by elected representatives and not the courts. The US Constitution grants Congress the power the impeach the president: “for, and conviction of, Treason, Bribery, or other High Crimes and Misdemeanors”. The question therefore may be whether obstruction of justice reaches the threshold of “other high crimes and misdemeanors”. Writing in Time Magazine last week, co-author of Impeachment: A Handbook Philip Bobbitt argues that it likely would. He points to the case of Richard Nixon, who resigned the presidency after impeachment proceedings had been initiated. The hacking of the Democratic National Committee in 2016 was clearly legally comparable to the Watergate burglary of the DNC in 1972, which led the House Judiciary Committee to approve articles of impeachment against Richard Nixon. We don’t yet known whether Donald Trump is implicated in the hack, but even if he isn’t, the Watergate precedent applies if he contrived to use his office to thwart an investigation into the crime. But even if Democrats do not push for impeachment and instead push for greater transparency on the Mueller probe, it’s likely to lead to a court battle that could run and run. Possibly into next year when Trump seeks re-election. It’s unclear what else is coming from the Attorney General, though he states in the letter that he is working to make more information public. He said he will be consulting with Mueller to determine what else can be released. But whatever is provided is unlikely to be enough for Democrats, who have said they want all of Mueller’s underlying evidence — including interviews, documents and material turned over to the grand jury. Email “To impeach or not to impeach? What the Mueller report means for Democrats”. Feedback on “To impeach or not to impeach? What the Mueller report means for Democrats”.